This is my favorite time of year, foodwise. So many wonderful things are available at the market this time of year. The thin, light meals of summer give way to heartier fare that autumn demands. Yet, there is still time to savor the fruits of late summer before the first chill makes its presence felt. 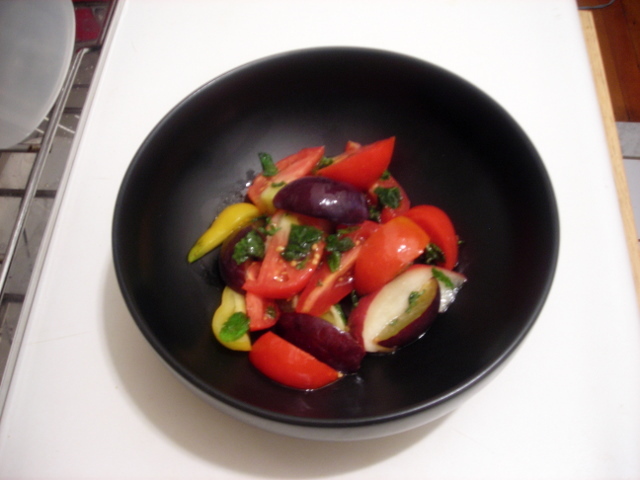 For this salad, choose a variety of tomatoes and pair them with plums and peaches. Apricots and nectarines are also good choices, if available. Season lightly with sea salt or fleur de sel; dress with lime juice, mint and extra-virgin olive oil and serve at once. 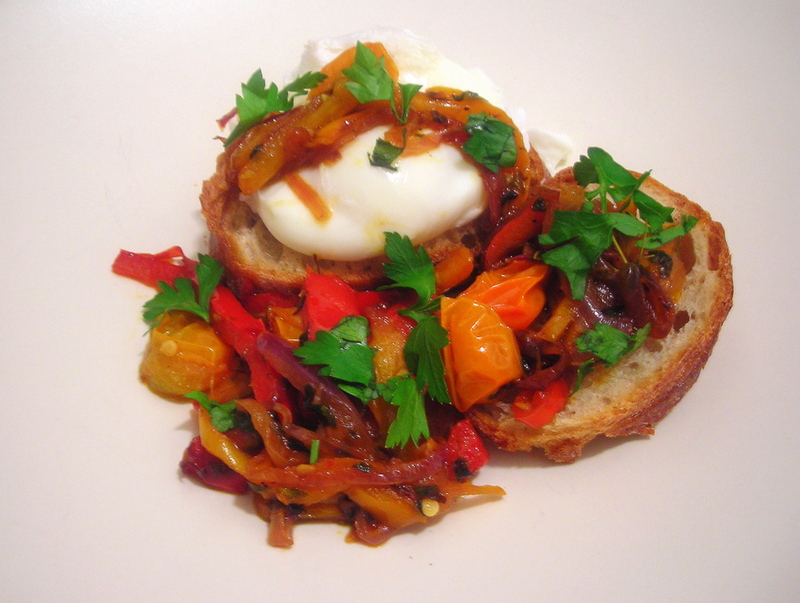 Peperonata is a Mediterranean dish composed of stewed peppers, tomatoes and onions. There are innumerable variations but I prefer mine as close to plain as possible. That means, no additions like balsamic vinegar and olives. This dish is packed with flavor that you don’t really need anything that would otherwise distract your taste buds, in my opinion. This is wonderful with omelettes, with pasta, as an accompaniment to roasted fish, or served with goat cheese spread on a baguette. Heat olive oil in a large skillet or Dutch oven. Add the onion, garlic, bay leaf and marjoram , and cook over medium-high heat, stirring frequently until the onion softens and becomes translucent, about 6 to 8 minutes. Add the peppers, a pinch of salt and raise the heat to high. Cook until the peppers soften, then add the tomatoes and reduce heat to medium. Bring to a simmer, stirring occasionally, until the tomatoes wilt slightly and release their juices, about 3 to 4 minutes. Check seasoning and serve immediately. (1) — Choose a variety of peppers. If unavailable, regular green bell peppers can be substituted. 22 Sep	This entry was published on September 22, 2009 at 3:17 am. It’s filed under autumn, food, general, Italian food, summer, vegetarian and tagged appetizer, cooking, egg, heirloom tomatoes, main dish, peaches, peppers, plums, recipe, salad, seasonal and local, slow food, vegetarian. Bookmark the permalink. Follow any comments here with the RSS feed for this post.